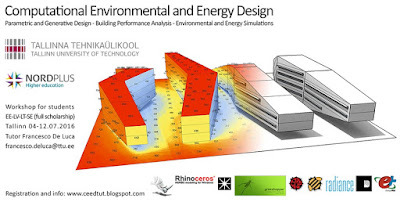 Francesco De Luca, Researcher at Tallinn University of Technology, is organizing this workshop on the integration of parametric and generative design methodologies with environmental and energy simulations for architecture and planning. The workshop is for students of architecture and civil engineering faculties at the master level from Estonia (11 seats), Latvia (3 seats), Lithuania (3 seats) and Sweden (3 seats). The selected students will have full scholarship that includes travel, board, and lodging in Tallinn for 10 days (arrival on Sunday 3 July 2016 - departure on Wednesday 13 July 2016). The workshop is funded by the NORDPLUS program of the Nordic Council of Ministers (NCM) - Higher Education objective. Digital and computational design tools are increasingly important for design and research for architects and engineers. They permit integration of environmental and energy aspects from the very early stages of the design and planning process, achieving more performative, efficient and integrated buildings and urban environments. The workshop attendants will broaden their design and technical knowledge with solar design, daylighting and energy efficiency topics. They will learn how to integrate environmental analysis and building performance analysis tools with parametric and generative methodologies in architecture and planning. Registration deadline: 31 May 2016. In the weeks just before the workshop, the blog will also present materials and tutorials to get a basic knowledge of the topics prior to the beginning of the workshop.